This particular soup is one of my favorites to make because it is relatively inexpensive, requires very little prep, and still delivers tremendous flavor. 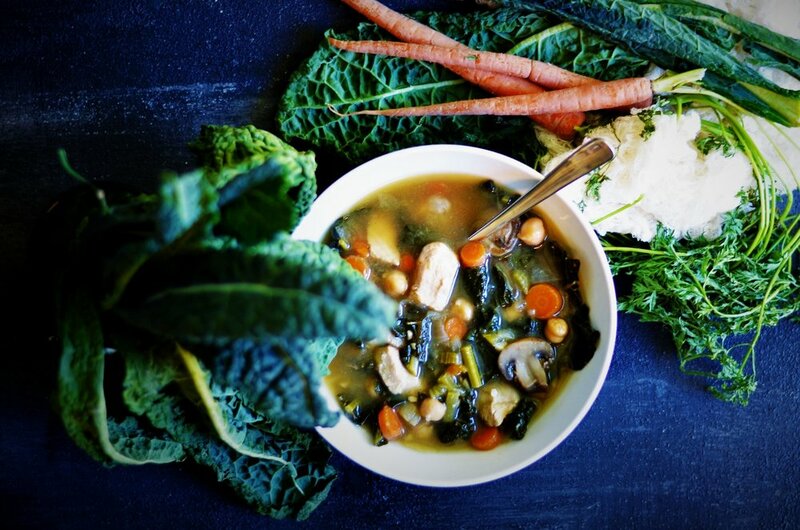 The main volume of the soup comes from kale and mushrooms, which are, like, fine, if you like tasting health. But, it’s like, if I wanted to taste a salad I would make one. The best part of this soup is that you barely taste the veggies because there are 10 cloves of garlic :). The flavor of the veggies still comes through, but they are tempered by the aromatics so they aren’t so vegetal. There is also some richness and textural variation introduced by chickpeas and chunks of chicken. Flavorful, easy on the wallet, quick to make – What’s not to like? Trim the chicken and cut it into 1-inch cubes. Heat the butter and oil over high heat in a very large pot until the butter is melted. Add the onion, carrots, celery, and garlic, and thyme leaves. Cook, stirring frequently, until aromatic, about 4 minutes. Add the mushrooms and the pepper and continue cooking until the onions are translucent and the mushrooms have absorbed the majority of the liquid in the pot. Add the chicken broth and the chicken cubes. Add the salt if desired. Bring to a boil, then lower to a simmer. Cover and cook about 20 minutes until the chicken is fully cooked through. Remove the cover and add the chickpeas. Continue simmering about 10 minutes. Add the kale and cook, uncovered, until fully cooked through, about 20 minutes. Stir in the vinegar and adjust the salt levels to taste. Pour the soup into bowls and grate fresh Parmesan over them just before serving.